Widespread throughout much of northern South America. Populations have been recorded in Ecuador, Colombia, Venezuela, Guyana, Peru and Brazil. Slow-moving and standing waters, including tributaries, swamps and coastal mangroves. The fish are usually found sheltering among roots or submerged vegetation. Not especially active, considering its size. A 48″ x 15″ x 12″ (120cm x 37.5cm x 37.5cm) – 141.5 litre tank could comfortably house a few of these. The species is quite shy and retiring, and needs plenty of cover in its tank. It seems to prefer hiding in thickets of plants over wood, rocks etc. Dim lighting will also encourage it to be seen more often. Excellent filtration and water management is a must, as it is sensitive to poor water conditions. Newly imported fish tend to be quite fussy and will only accept small foods, such as bloodworm, Daphnia or granulated dried varieties. Once acclimatised to aquarium life, it becomes not only less selective, but also more confident and will often be seen cruising the tank at feeding time. Despite its size, it is not a predator and is safe with all but the tiniest of fish. 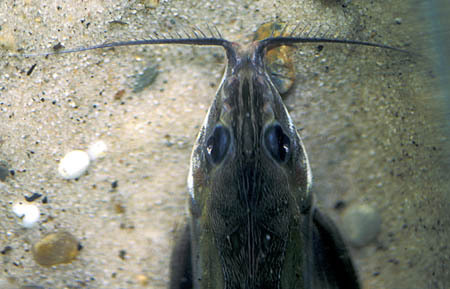 It might intimidate small, sedate bottom dwellers such as Apistogramma species with its sheer size, though. Species that inhabit other areas within the tank, such as tetras or hatchetfish are less of a problem. 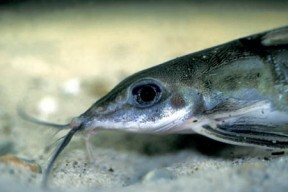 It is also safe with other catfish. The majority of Corydoras and many Loricariids make good tankmates. Don’t keep it with anything significantly larger or more territorial, as it’s easily intimidated. It is by nature, a shoaling species and will be more confident, and appear far more often if maintained in a group of at least 3 specimens. Males possess an elongated first dorsal ray. Females have more rounded pectoral fins than males. This species can be quite delicate when first imported, but once settled is usually quite hardy. When buying the fish, check that it has a rounded belly and that its eyes aren’t sunken. 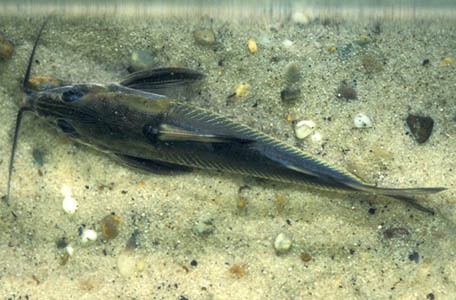 These are classic signs of emaciation in newly imported specimens, and fish in this condition do not often survive for long. If you can find healthy specimens for sale, it is a charming addition to the larger community tank. 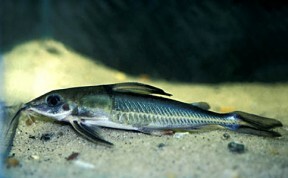 It is superficially similar to the closely related Nemadoras leporhinus. The two can be distinguished by examining the fins. Nemadoras has longer first fin rays and a clear dorsal fin with a dark patch at the base. Like other Doradids, it is capable of producing audible sounds. It can produce these in 2 ways. The first is by locking the pectoral fins into their sockets and grinding the spines against the socket, producing a ‘buzzing’ sound. The second is by rapidly contracting and relaxing a muscle that is attached to the back of the skull at one end, and the front of the swim bladder at the other. This causes the swimbladder to resonate and produces a slightly deeper sound. The noises can be quite loud, and can sometimes be heard through the aquarium glass or when the fish is netted. 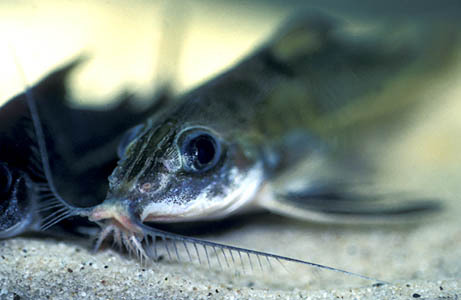 A word on netting these cats; the spines on the pectoral fins can easily become entangled in the mesh of aquarium nets, so take care if you need to catch the fish for any reason.